In a blog posted back in July we talked about why businesses should record data. “The main purpose of recording factory losses is to understand where we are losing time, speed, quality and ultimately money. This allows us to focus our (limited) resources by identifying the big problems across the manufacturing elements of our factory and profit centres”. Is that enough though? Do we always get it right? I was recently working with a client who called us in to help them sort out their problems with machine availability. The site had a good data collection system in place (or so we thought) and their data was telling them that their biggest problem was with breakdowns. We agreed to develop an internal planned maintenance system but during the first visit, after trying to figure out their specific data recording and reporting system I realised that breakdowns were NOT their biggest problem. The site had been recording breakdowns, changeovers, cleaning time and unplanned production, but there was no data recording for minor stoppages. Effectively the site captured the easy data, and assumed the rest of the time was productive. In fact there was a large gap between what the machines produced when they ran and what they should have produced given the amount of time that they ran. For example, if they were supposed to produce 1000 units per hour, and only produced 800, the remaining time was unaccounted for unless there was an actual breakdown. When we dug further we found that breakdowns were not the biggest problem, minor stoppages were. Recording data will help you identify your losses and focus your efforts in the right area; however, this is only the case if you record the right data! Think about what information you need – does your data collection provide the right information? Is it at the right level of detail? Data is just data until we convert it into information – but if we aren’t looking for the right information, then we won’t be recording the right data. Delivery: On Time and In Full: But At What Cost? New Product Introduction: Delivery Crisis was a Major Threat to Business. I have just spent three days helping out a client with a serious delivery crisis due to the introduction of several new products for a major customer. They are a medium sized component manufacturer with a good reputation, experienced team of people and a range of technologies. When I arrived the team had been working all hours trying to get parts out the door. They had an agreed minimum quality sample. The customer needed 400 per day but Kev, one of the best operators could make only 1 piece every 2 minutes and only 60% were good enough, nobody else could do the job. Roughly speaking he needed to work 22 hours a day! This was over and above the regular busy schedule of the normal business. The team; managers, engineers and operators were exhausted. This is where the consultant has the advantage. Focused on the single issue with no axe to grind I could see the issues clearly. First action was to draft a plan. A plan that would stabilise the situation to keep the customer satisfied, return the operation to normality and save the team from certain failure and personal breakdown. In these situations I find the solution lies in foundation tools. Standardisation, Standard Operating Procedures and Systematic Training work effectively to achieve the necessary results. We needed to develop a Standard Operation and then train people to the same skill as Kev – he is good but not superhuman. To carry out a detail task analysis, draft SOP, test and verify them with any team is a challenge; with a team that is at breaking point working against the clock you have to be confident of your plan and processes. Within the first day I had enough detail to start training an operator from the next shift, building their skill and confidence to be close to Kev’s quality. A second operator was trained so now we were starting to see progress; enough for the exhausted managers to go home and get some sleep. By the following day we had two operators on all three shifts able to work to the quality standard and the reject rate was improving as their skill developed. Now the parts were flowing to the customer so everyone was a bit more relaxed. With the situation stabilised I could start on the improvement work. The current method worked but at a high cost. Now that everyone was a little calmer I could use the team to eliminate waste and get the process flowing. Within 2 days we had developed the methods and standardised procedures to be better than the original cost estimates. Before I left I reflected with David who was still badly bruised by the experience. They had the tools and procedures in place and used them regularly. Why when under pressure do we throw away the procedures that ultimately save us? He still has a great deal to do in understanding the root cause of this crisis and putting in countermeasures to avoid a repeat; but that is another story. Wirral, UK. 25th October 2010. UK based specialist business improvement training company; Kaizen Consultancy & Training Services (KCTS) are currently delivering their flag-ship Total Productive Maintenance (TPM) Instructor Course to world leading plasterboard manufacturer, Saint Gobain Gyproc. The two week event is being held in Toronto, Canada and involves thirty two senior managers and other personnel representing Saint Gobain Gyproc plants from around the World. Saint Gobain Gyproc is now into their ninth year of a World Class Manufacturing programme which encompasses 68 manufacturing facilities in 54 countries. The Instructor Course is the fourteenth event held to date, all of which have been delivered by Kaizen Consultancy & Training Services. Delegates who participate in this intense training will qualify as Instructors in TPM once they have gone back to their respective plants and led improvement projects. They are then reviewed in areas such as; 5S, Problem Solving, Autonomous Maintenance and Professional Maintenance 100 days later. As a result of this training outputs have increased by up to 40%, product quality has improved, safety performance is better and costs have been substantially reduced. Saint Gobain Gyproc have made an estimated 95 Million Euro in efficiency cost savings and are well underway to achieving Silver Plant status within their World Class Manufacturing model, throughout the Global Gyproc division. KCTS are an international training & consultancy provider of specialist World Class Manufacturing (WCM) standards. Delivering TPM, Lean, Change Management and Policy Deployment programmes to the manufacturing and service industries Worldwide. Through these proven methodologies KCTS can reduce costs by identifying and removing losses within a process or value stream. For further information regarding this press release or KCTS, please contact; KCTS on 0151 608 9036 or visit www.kcts.co.uk. 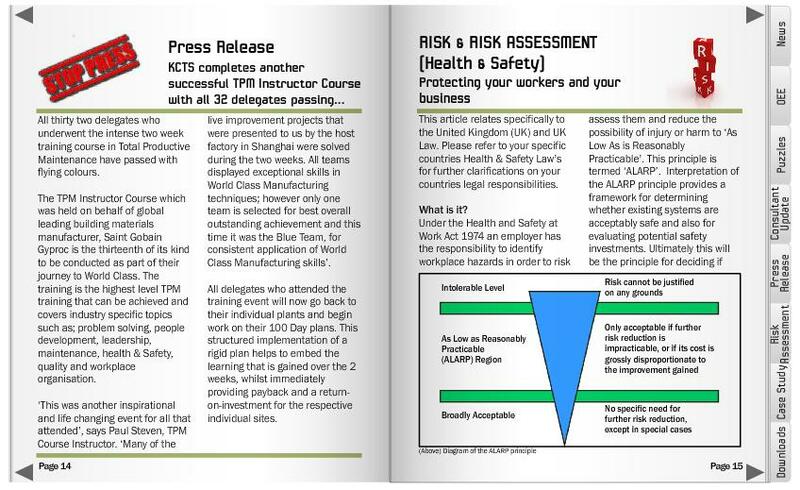 Don’t forget that the July Issue of the KCTS Resource has been released and is available to read via the Downloads section of the KCTS Website: In this issue we take a look at Risk and Risk Assessment and Health and Safety in the workplace, as well as, how Overall Equipment Effectiveness can be a foundation stone to any Lean Improvement Programme. There is also the regular features, including; a couple of Lean/TPM puzzles to test your mind with; a Press Release about the success of Instructor Course 13 which happened over in China; a Case Study on using SMED for our client in their Zevenaar factory, The Netherlands; and we’ll be catching up with KCTS consultant, Malcolm Newman, and finding out what he has been up too over the last 6 months. Also our free downloads this month include the ‘Targets Settings & Sharing’ and ‘Business Performance or Local Measures’ knowledge sheets, and List of Risk worksheet. Plus you will be able to download the PDF of this month’s KCTS Resource, all for Free! KCTS’s “Mobile Investigation Camera Kit” (MICK) has been Factory tested. Wirral, UK. 26th July 2010. After successfully completing upgrading our MICK to MICK 2, the latest model has now been fully testing in a live factory environment. Matthew Treby (Technical Consultant) has been to a local factory and put MICK 2 through its paces to evaluate the system and ensure the quality of the product and picture was perfect. The unit has had a complete revamp after taking into account feedback from people who have used the previous MICK kit. These improvements include a completely new camera cabling system that is lighter, more flexible and can run for longer lengths. The cases have also been improved so they are more portable, hardwearing and the components split into several flight cases, allowing easier access and lighter to carry. The picture quality from the cameras has been improved allowing sharper and clearer images to be recorded and played back at various speeds. To further enhance the viewing experience the monitor size has also been increased. Due to the improved image quality we have upgraded the storage capability, as well as making it easier to get data from the unit by DVD and memory stick. Finally MICK 2 is easier to use, than the previous MICK, with the inclusion of a mouse and remote control. The system still retains it core fundamental components of clamps, arms and tripods, as these are essential in order to position the cameras accurately in awkward positions. Despite all the many improvements that have been done, MICK 2 can still function at 110 Volts or 240 Volts so can be used worldwide with no modifications. The MICK 2 system will be on sale from September. No picture tearing that comes from interference from electrical motors and machines. The system can now cope with longer runs of cable enabling the camera to cover a larger area (50 metres instead of 30 metres). The main Audio Visual unit is now portable with the introduction of wheels and a pull handle. The system can record continuously on up to 8 channels at a D1 resolution instead of the lower CIF, this has doubled the quality of the image. The whole system still runs at 110v, but has been upgraded to run at 240v if needed. However the most important thing is that it is still very easy to use and very quick to learn. Now the testing has been successfully completed, a fully operational 4 and 8 camera MICK system will be built to support our training courses, as well as available to buy. 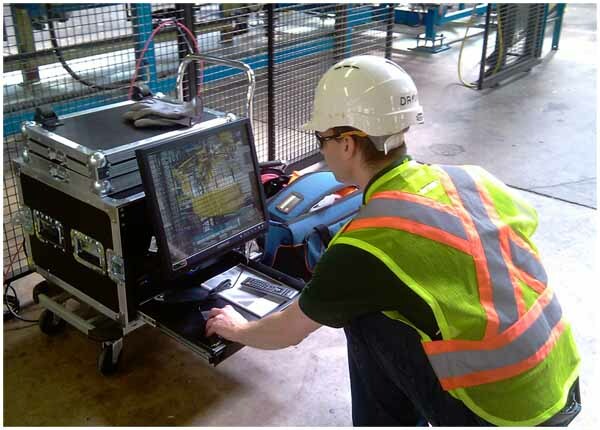 Whenever problems are solved, all 5G’s are used but the 1st G – Gemba must always be studied to check our assumptions are correct. For simple problems it is possible to use Gembutsu, Genjitsu, Genri & Gensoku based on experience as explained above to create solutions which are not too expensive or difficult to implement. The study of Gembutsu and Genjitsu can be made systematic. This has 2 benefits, firstly it gives a common method to all the people across an organisation on how the facts and physical evidence are recorded and used. The second benefit is that systematic problem solving gives a common language to all levels in the organisation on the facts and physical data to create a common understanding of the problem. KCTS uses the method known as 5W+1H to create a repeatable, systematic problem statement by asking the following questions and summarising the answer. • What product is related to the problem? • When did the problem occur during the activities of the manufacturing enterprise? • Where on the product and / or within the process was the problem created? • Who has more of these problems compared to their peers? • Which trend can be seen over time? Is the problem getting worse or better or repeating in alignment with other factors? • How is the problem physically manifesting itself? The remaining G’s of Genri & Gensoku can be studied if experience does not reveal the causes of the problem once the 5W+1H problem statement has been created. If the immediate causes are understood, root cause can be found. Root Cause is defined as when the problem affects human behaviour, it is not suitable to continue through the reasons for this first human behaviour unless this is the original reason we are investigating. It is also not suitable to stop the investigation until this human behaviour has been found. If a problem occurs due to physical problems within the workplace, why are these physical problems not being resolved? The use of 5 Why analysis allows us to test the detail of our 5W+1H. If we have not found the root cause by asking Why 5 times and validating the possible responses to demonstrate factually the reasons for the problem, the problem statement requires more study of the facts and data. If the root cause is found earlier than 5 Why’s then we may stop the analysis at that step. Once the root cause is found, the benefits of Focused Improvement come from implementing a solution that eliminates that cause. Once eliminated, the problem cannot reoccur. There will be other problems occurring within the process and areas studied, but the same problem cannot reappear unless the conditions of the area change. The application of Focused Improvement in companies across the world has given direct benefits to the places where it has been implemented, plus allows time and attention to be focused on the systems needed to stop the problem reoccurring. 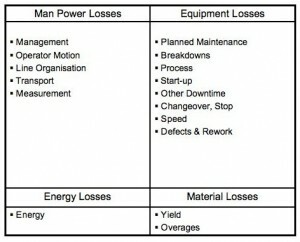 Systems and processes are needed to control the human behaviours used within all manufacturing enterprises but such processes require improvements. 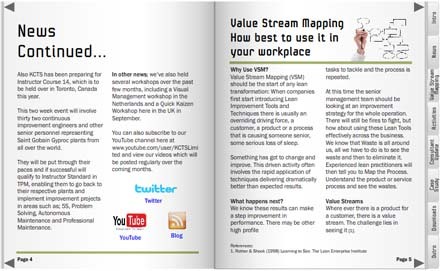 By focusing on facts and data, the opinions which can often divide organisations are removed and thus logic is used to drive decision making which ensures all standards used become the latest, best standard.